Can be equipped with either ­standard roll ­applicator or ­UMV´s jet ­applicator INVO® Jet. The system is based on the principle of the backing roll providing the reference point for the ­profiling system. This means that interference from the blade holder position or ­movement is ­eliminated. The result of this principle is a self-positioning system that delivers uniform and ­excellent profiles right from the start of the coating process. 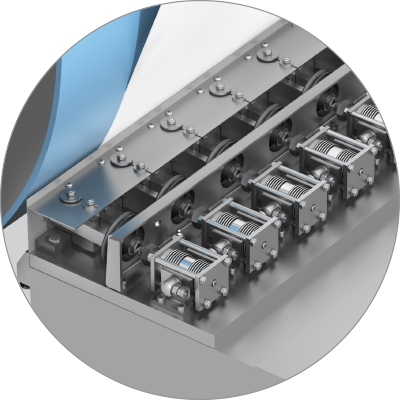 The ABC™ control mechanism is reliable and developed to ­withstand the harsh environment in the coating machine. The control actuators are made of acid-proof stainless steel. The first actuator of this type was installed in 1998 and they have proven to be maintenance-free. The ABC™ system delivers excellent profiles also in manual mode due to the self-positioning. This is shown by the ­initial 2-Sigma values that are achieved. The product is in quality already from the start. The ABC™ profiling can be linked to the QCS system, the final result is based on the capability and quality level of the QCS system. Chart showing the 2-Sigma value over time. The first 2-Sigma value from the scanner is normally twice as good compared to a ­conventional system. Chart showing the repeatability of the ABC™ System. The settings from previous production are valid.